The asteroid was first detected Oct. 19 by the University of Hawaii’s Pan-STARRS 1 telescope on Haleakala, Hawaii, as it scanned the sky to search for near-Earth objects for NASA. Calculations suggested it might be an interstellar interloper, and scientists announced Monday they have confirmed it came from outside our solar system. 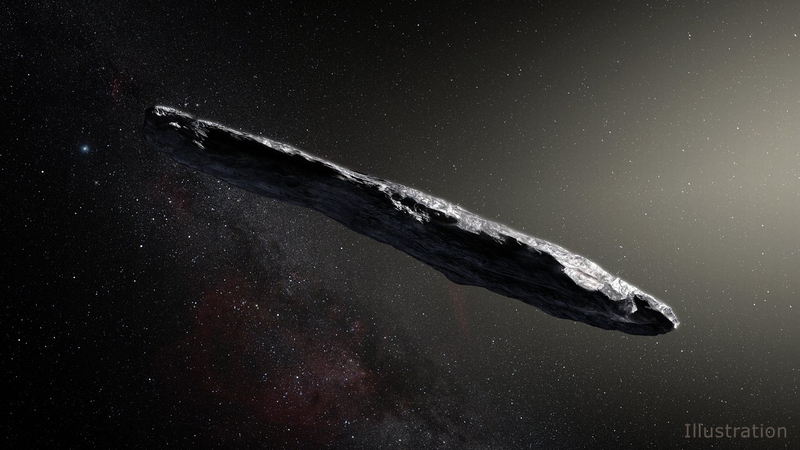 Designated 1I/2017 U1 and nicknamed ‘Oumuamua — a Hawaiian word for messenger or scout — the object appears reddish in colour and has an elongated shape. Measurements from an array of telescopes indicate the object is up to a quarter-mile (400 metres) long and spins once every 7.3 hours. “This object is simply a piece of another solar system that was expelled, and it has been travelling through interstellar space for hundreds of millions of years, or billions of years. We don’t know,” said Paul Chodas, manager of NASA’s Center for Near-Earth Object Studies at the Jet Propulsion Laboratory in Pasadena, California. Data and findings on the interstellar asteroid were published in the Nov. 20 issue of the journal Nature. Astronomers initially classified the discovery as a comet last month, but further observations showed it to be inert, with no signs of gas or dust around it, prompting scientists to consider it an asteroid. ‘Oumuamua’s dark reddish colour is similar to the hue of many objects in the Kuiper Belt, a zone of dwarf planets and asteroid-like worlds orbiting the sun beyond Neptune. Its appearance suggests ‘Oumuamua is dense, made up of rock or metallic elements and lacks significant water or ice, scientists said. “We also see that it’s very reddish in colour, which indicates that it’s been possibly in space a long time and irradiated by not only the light from our sun, but other suns as well,” said Lindley Johnson, NASA’s planetary defense officer. The European Southern Observatory’s Very Large Telescope in Chile aimed its aperture at the object to determine its, colour, brightness and orbit, revealing it came from the approximate direction of the bright star Vega in the constellation Lyra. But Vega has moved in its path around the Milky Way galaxy since ‘Oumuamua passed near its current position some 300,000 years ago, so the asteroid’s origin is still unknown. After following a steep trajectory toward the inner solar system, ‘Oumuamua is now on the outbound leg of its hyperbolic orbit traveling more than 85,000 mph (38 kilometres per second) relative to the sun. As of Monday, the object was about 124 million miles (200 million kilometres) from Earth, positioned between the orbits of Mars and Jupiter but tilted on a trajectory inclined around 20 degrees from the plane of the planets that orbit the sun. It will pass Jupiter’s orbit in May 2018 and surpass Saturn’s distance from the sun in January 2019. ‘Oumuamua’s trajectory will next take it toward the constellation Pegasus. ‘Oumuamua made its closest approach to Earth on Oct. 14 — before its discovery — at a distance of about 15 million miles (24 million kilometres), or around 60 times the distance between the Earth and the moon. 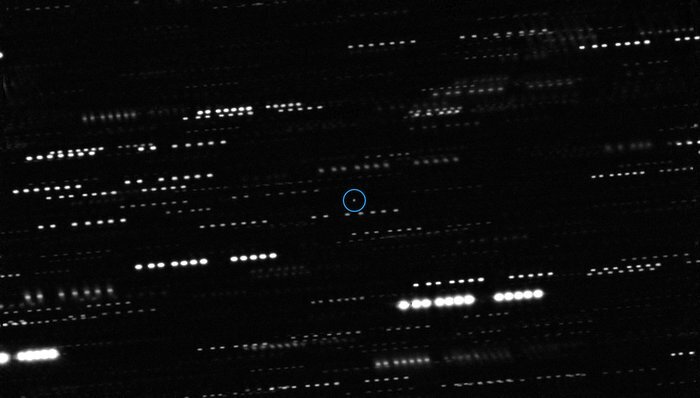 Astronomers expect an interstellar object like ‘Oumuamua passes through the inner solar system about once per year, but they are difficult to find because of their faintness and quick movement, according to an ESO press release. But ‘Oumuamua’s discovery did pose a nomenclature dilemma. The International Astronomical Union, the organisation responsible for formally naming celestial objects, had to create a new classification for interstellar objects earlier this month, resulting in in the “I” in the official name 1I/2017 U1. ‘Oumuamua is moving too fast for any conventional rocket to catch up, and plans for future interstellar travel using light sails and miniature spacecraft have not been realized. 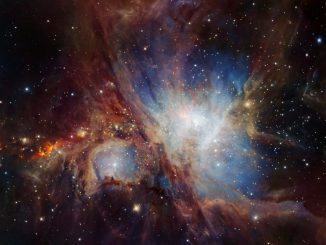 The European Southern Observatory’s HAWK-I infrared instrument on the Very Large Telescope (VLT) in Chile has been used to peer deeper into the heart of Orion Nebula than ever before. The spectacular picture reveals about ten times as many brown dwarfs and isolated planetary-mass objects than were previously known. In this new image of the nebula Messier 78, young stars cast a bluish pall over their surroundings, while red fledgling stars peer out from their cocoons of cosmic dust. 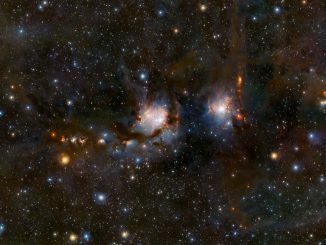 ESO’s Visible and Infrared Survey Telescope for Astronomy (VISTA) sees near-infrared light, which passes right through dust, permitting astronomers to probe deep into the heart of the stellar environment. Comet 45P/Honda–Mrkos–Pajdušáková passes just 0.08318 astronomical units (7.73 million miles, or ~32 lunar distances) from Earth on the morning of 11 February. 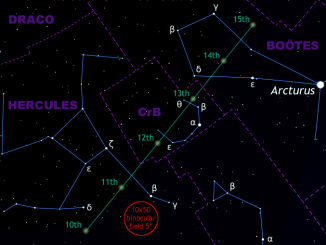 Early risers can catch the magnitude +7 comet speeding through the constellations of Hercules, Corona Borealis (CrB) and Boötes at up to 9 degrees/day.